A new release of programs that supports the unloading of the sales book for the tax office, all users who have extended the update can get free of charge in the FOLIO office. Familiarize with functional changes and additional possibilities of the warehouse registration programs which have appeared in the I quarter of 2019. The issue of rounding in the documents is ambiguous and, in fact, mathematically unsolvable due to the fact that in the calculation of the amounts involved small quantities of a product (with accuracy to a few characters) or small prices and this is compounded by the calculation of the tax, which is calculated from the amount and is included in the calculated amount. At the same time, many accountants require that the total amount for all goods coincide with the accuracy of two characters. Mathematically, it turns out nonsense. In reality, the amounts for the goods cannot coincide with the total amount for the document, calculated up to two characters. In 1C: Accounting made the option of showing the document, which adjusts the amount of the documents, showing the wrong, but visually understandable calculation. Going to meet the wishes of users using 1C: Accounting, we have long made it possible to show the document as in 1C:. In the feature reference FOLIO describes about this setting. But many do not know about it. For these types of transactions prices for the formation of the amount of the document will be considered as 1C:. Due to the change in the VAT rate from 18% to 20% since 2019, FOLIO programs have implemented a mechanism for correcting the VAT rate on a group/subgroup of goods. If you have VAT set in the documents-just from 01 January 2019 enter a new tax rate of 20% if the tax is on top and -20% if the tax is including. In FOLIO WinМаркет have the opportunity to pay one ticket partially with the card and partly in cash. In the module «FOLIO Check» of «FOLIO WinStore» – program – this possibility has already been implemented previously. From December 1, 2018, the prices for programs maintenance change. Service invoices, issued before November 15 with a discount on the promotion and not paid by that time, will have to be paid at the full service price for the respective programs. The possibility of connecting the integration module of an accounting program «FOLIO WinStore» with the system of Vetis FGIS «Mercury» is realized. The «Mercury» system is intended for electronic certification and traceability of products supervised by the Rosselkhoznadzor in order to create a common information environment for veterinary use and to improve biological and food safety. According to the Federal law of 01.07.2015 №243 "On amendments to the Law of the Russian Federation "On veterinary medicine", all products of animal origin is subject to mandatory electronic certification, registration of veterinary accompanying documents (VSD) in the Federal state information system (FGIS) «Mercury». Transition to mandatory registration of VSD in electronic form (EVSD) is introduced from July 1, 2018. Integration of the accounting system "FOLIO WinStore" with FGIS «Mercury», implemented using a universal gateway VetIS.API allows to automate the redemption of EVSD, making transportation and production of EVSD, to obtain data inventory journal batches, that is listed by the enterprise in the system of the FGIS «Mercury», to conduct their inventory. To purchase the solution and get advice, please contact the company's office. FOLIO company - a quarter of a century! a Quarter of a century has passed to FOLIO and we are pleased to welcome all our loyal users who have been keeping records with our company's software for many years. we Hope that we will continue to support each other. In anniversary year FOLIO has several large and interesting new projects. We hope that the new ideas and solutions incorporated in them will be useful to our clients. FOLIO wishes You a good year, dear users! The application is designed to automate the work of field managers and sales representatives of companies using the trading and accounting program «FOLIO WinSklad». It is used on mobile devices (smartphones, tablets) running Android 5.0 and higher. A new Web application "FOLIO Internet-Order"
The application is intended for wholesale businesses (wholesale suppliers) using the program "FOLIO Winsklad." It allows the company's customers to place orders for goods on the vendor's website. At the same time, information about the status and progress of orders is automatically transferred to the FOLIO warehouse program database. All modern versions of FOLIO programs run on versions of MS SQL server starting from 2008 and higher, so the replacement version of FOLIO SOFTWARE - a new one, made only for these versions of the server. If you have MS SQL server 2000 yet, you must upgrade it to at least 2008 before you install our software update. In addition to the possibility of using a newer version of FOLIO Winsklad with new functionality, you will get a program that works faster by optimizing the server or its free version (MSDE). FOLIO company integrates the program WinСклад with the system of Electronic data interchange (EDI) «Contour Deadoc». Electronic documents signed by qualified electronic signature (CEP), are equal to paper counterparts and do not require duplication on paper. Developed functionality allows you to send contractors legally relevant documents - invoice, Torg-12 and DFC in the approved format, on. Sending to the server, EDI happens automatically on the same document, or a package for multiple - selected. Sent documents can be automatically signed cap, signed documents produced in the interface of Deadoc. Specifically designed to work with EDO made additional functionality to the document – «State operations». Here is filled with the status set of an electronic document. When updating the register of documents in the «FOLIO WinStore» – information on the status of the electronic document is processed on the EDO server and changed the value of the «State operations» is returned to the register. The documents selection from registry on the «State operations» parameter is worked. For acquisition decisions and advice, please contact the office of the company. Company "FOLIO" integration is implemented with hardware-software complex "OPTIMUM Mobile online-cash" company CDC, which consists of: a portable receipt printer with a cash register, a mobile application installed on a phone or a tablet terminal for payment cards (optional) and a personal office with access to the web server. The system provides creation, modification, receipt printing, and transmission of electronic versions of checks to the tax authorities and the buyer in accordance with 54-Federal Law. FOLIO from the database to the web server complex OPTIMUM unloaded data necessary for the shipments to the buyers that the goods leaves the courier. The courier hands over the goods to the buyer in the mobile app in the online office on the tablet is the necessary receipt (invoice), adjusts it in case of client's refusal of the goods by removing the excess position receives payment (cash or credit card) and prints a receipt. Sales data leaves the operator's fiscal data (CRF), and then to the Federal tax service. The customer receives an electronic version of the receipt to the specified email address and/or phone number by SMS. Sales data go to the database FOLIO in the form of Credit and cash orders and the record of the payment invoice. After you select the fast button is pressed, the Card can be corrected, but these changes will not be taken directly to the invoice/ payment. Below changes have been made in the register or document required by the re-election organization. For column My organization (name of private organization) opens the card of the organization (basic details) by matching the full name. I.e., in the case when with one full name in the directory there are several organizations that will open the card for any of them. In the case when the private organization selected additional details the card will not open. Made a quick selection of random documents. To do this, select one of the required documents and nagatou key "Ctrl" key to position the cursor with the mouse alternately on the right lines. Selected rows are highlighted. After pressing the button «DOP.OTB.» (Fig. - marked striclly) menu bottom row pane of the registry:Selection of the highlighted documents -> Set selection, you can make a selection in the selected documents. This selection does not affect the reports. This feature allows for easy data transfer to Excel or Word or any other program, and take data. 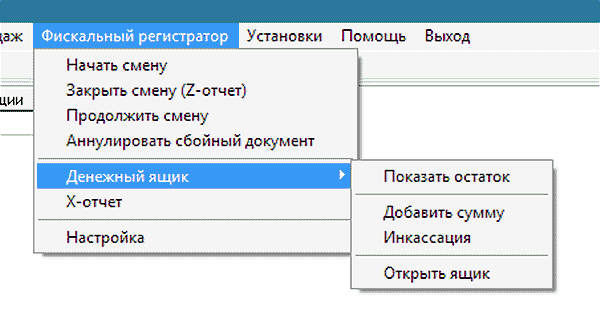 Click the right mouse button, while the button «New.TVR.» in the input box and click «From clipboard». The products table will be filled in the appropriate buffer with the goods and their quantity. This requires that the top line of the transmitted data column names match the column names in the input window. The products table will be filled in the appropriate buffer with the goods and their quantity. This requires that the top line of the transmitted data column names match the column names in the input window. October 1, 2017, enters into force a new form of the invoice, approved by the Decree of the RF Government dated 19.08.17 No. 981. Changes made not only in form but also fill the order. FOLIO users who have the service, you can get a new form by e-mail (mail@folio.ru) on request or in our office. In the FOLIO WinStore programm the functionality of sending of a buyer check by sms or by e-mail was added. To check the send sms ability, contact Your carrier fiscal data (CRF). From 1 July 2017 the Government decree of the Russian Federation from 25.05.2017 No. 625 changes the form of the invoice. Changes in the form of invoices submitted in connection with the entry into force of the Federal law from 03.04.2017 № 56-FZ, extends the amount of information that must be specified in the document, put the sale of goods (works, services) and the transfer of property rights. The «FOLIO» company turned 24 and we are pleased to welcome all of our loyal users, who for many years lead their accounting with the software of «FOLIO» company. Hopefully in the future, we will support each other. In its 25th year FOLIO has several large and interesting new projects. We hope that their completion and implementation will be useful for our customers. FOLIO wish You a good year, dear customers! - in the system of warehouse management (WMS). To receive payment from banking card of Sberbank in the "FOLIO WinMarket", the support of a banking terminal VeriFone VX 820 have been realized. The warehouse management system «FOLIO WMS» started on the warehouse of «Chernaya Rechka» company - the largest Russian supplier of art materials. In the warehouse of enterprise – (class b, 2 floor, area 1400 sq. m., range ~ 40 thousand names) applied shelf storage.. The launch of the WMS system made by forces of employees of the company on the basis of the combined standard solution, is proposed developer company. Company «FOLIO» completed development and testing of the connection mechanism and the interaction of the CRE (Cash Register Equipment) transmitting the Operator Fiscal Data (OFD) in on-line mode, «WinStore Torgzal FOLIO» and «FOLIO WinМаркет». Currently supported devices brands «ATOL» and «Bar». The use of new generation CRE, transmitting the data to the tax authorities in the online mode (online / cash) will be required mandatory from 1 July 2017. For advice, please call the office. In accordance with the new wording of the Federal law 54-FZ (Federal law of 03.07.2016 No. 290-FZ) 1 July 2017 organizations and individual entrepreneurs, except for payers of ENVD and entrepreneurs on the patent, will have to use just CRE the new generation (online-cash registeres). And from 1 July 2018 the use of the online-cash registeres will also be mandatory for payers UTII and entrepreneurs on the patent. The connection and interaction of the new generation of cash registers with the «Torgzal FOLIO» program is designed by «FOLIO» company . Thanks to the cooperation with manufacturers and operators of fiscal data, a simple and user-friendly functionality of the online cash register is implemented. For user storage programmes FOLIO is designed to integrate with the Internet service "Personal account". Now the customer of the supplier do not need to call for more information: what about my order? He finds out, logging into his account online. the planned date of receipt of the ordered goods. All this information is available by unloading the required data from the database of the FOLIO program. The identification of customer and its orders are anchored with the registration number which is automatically generated when the card organizations is created. is carried out with discount of 30%! During the share the clients of FOLIO, registered up to May 20.2016, can gain additional workstations of any our programs with discount of 50%! hurry to be in time! the following possibility only after one year! - in programs of a warehouse (WMS) handle. Integration of the program "FOLIO WinStore" with electronic document management system of the company "SKB Kontur"
Developed and implemented several customer integration program "FOLIO WinStore" with electronic document management system "Circuit.EDI" company "SKB Kontur". Created a number of standard forms of documents for exchange. Typically, for clients FOLIO, the initiators of the work with electronic data exchange are the trading network, each of which may require some additional features to the existing standard forms of documents for exchange. To fully enjoy the integration requires version «FOLIO WinStore chain stores». In this version there is a possibility to comply with the articles of the company-user of the program "FOLIO WinStore" item corresponding to the trade network, and receiving and shipping goods. The development made for the following types of transactions: "goods - Order", "order - Confirmation", "Confirm - receipt", "Invoice – proforma invoice". 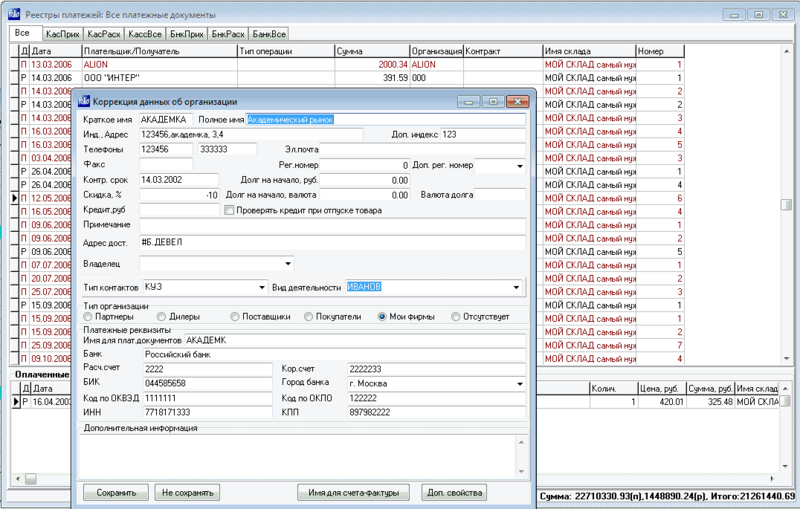 Thus, for Suppliers - users of the FOLIO in retail chains and other companies developed the following mechanism for the integration with a provider of electronic document SKB Kontur, allowing to receive, process and send primary paper accounting (invoices and waybills) and the proforma invoice to the database FOLIO. The buyer sends the purchase order. The order is processed and accepted in FOLIO. Invoice is created. The buyer receives a message indicating that the order is accepted by the Supplier. After processing the invoice of the order the Buyer receives a Confirmation message of the order, stating that, in what quantity, and when the Vendor plans to ship to the Buyer. After shipment and create invoice it is processed and the Buyer is sent a notification of the shipment, i.e. e-Trade 12. Upon actual receipt of delivery to the Buyer, he creates and sends to the supplier the notification of acceptance. This message is processed, and data on actual acceptance shall be recorded in the FOLIO. By virtue of the fact adjusted invoice. After forming in FOLIO of the proforma invoice, it is processed and sent to the Buyer. In the system Deadok SKB Kontur created a draft e-invoices to be processed accordingly. Interaction with EDI*) - provider "SKB Kontur" is via FTP. *) EDI (Electronic Data Interchange). The unit of integration between programs «FOLIO WinStore» and system USAIS (uniform state automized information system of the registration of size of production and turn-over этилового of spirit) is developed. Since January 1 according to the order of the federal tax service the companies, trading in alcohol, are obliged to interchange with USAIS according to the standard protocol the information on size of production and turn-over ethyl alcohol, alcoholic and alcohol containing production. The special version of the program «FOLIO WinStore-USAIS» will allow ground gated in in the warehouse unit of the data and data obtained from USAIS, to organize valuable exchange appropriate to the standard, required by the federal tax service. If you keep account in this program, automatically there are necessary warehouse documents and helps, they are referred and are accepted in USAIS. Confirmation of the fact of delivery of alcoholic production (reception, partial reception or refusal). Request of the items of information about registered in USAIS of organizations. Request of the list of issued alcoholic production on the manufacturer. Production of alcoholic production and beer on balance in USAIS (inventory of alcoholic production, available in the company). Request of the rests of alcoholic production and beer on own organization. Request and obtaining in electronic form reference A and reference B. Writing off of alcoholic production through USAIS. The warehouse of the known company «MDM a Package Design» (delivery furniture components) 6 months successfully functions under the control of the program complex «FOLIO WMS». This service is paid. Its cost makes - 1800 roubles. The dealer and other discounts are not distributed to the given service. Since July, 2015 by agreement with the known «EkoNiva-Teсhnika» company the cardinal conversion of the large number of business processes is conducted. Holding «EkoNiva-Teсhnika» - one of the largest suppliers of import agricultural engineering of the carrying on world manufacturers in Russia having representations in 14 locales of Russian Federation. Already there are a lot of years holding uses programs of the «FOLIO corporation» for support of the activity. It is warehouse registration programs, WMS-solution, solution on handle of deliveries and oth..
At the present stage of development of holding there were new tasks, which solutions in the present moment are developed by the experts FOLIO. With the program «FOLIO WinStore» the new form of the declaration on the VAT in the new electronic format of the XML-file, accepted by the «Tax Bearer» program and other authorized taxing authority by operators is delivered. FTS of Russia the new form of the declaration on the VAT was authorized. It is applied, since the first tax period of 2015. The form is supplemented by new sections 8 - 12. In them, in particular, the items of information from the books of purchases and sales, log-book of the obtained and exhibited invoices are switched on in case of exhibiting and (or) obtaining by the commission agents (agents, forwarding agents, застройщиками or customers fulfilling the functions застройщика) of the invoices at realization by them of enterprise activity in interests of other person. The payers of the VAT, and also some other categories of the persons represent the declaration in the new electronic format, since tax period for the first quarter of 2015 not later than 25 numbers of the month following expired period. The simplified technology of record-keeping on places of storage in the large warehouse is developed and is inserted for one of large clients FOLIO. Main advantage of such technology in the small costs both on implantation, and on support. Thus, the warehouse can function reliably enough and precisely. For those who does not want a message the absolutely exact registration in WMS-system on places of storage, and is ready удовольствоваться by inexpensive solution on a base of FOLIO Logistc-Warehouse (WMS) without usage of wireless terminals and штрихкодирования of the goods, FOLIO can offer the new technology of operation already successfully used for one of large clients. The given technology was developed as much as possible to unload both operators, and loaders, which now should not brake the process by data entry about the made operations of loading, moving and other. On a base of the standard version Logistc-Warehouseа the path sheets with the jobs(definitions) for the loaders, with the indicated goods and places of storage are permanently printed out, with which it is necessary to make appropriate operations of arrival, shipment or moving. The free loader takes an arbitrary path page from among printed out and approaches to the scanner, which is fused to the computer and special program, started up on him. 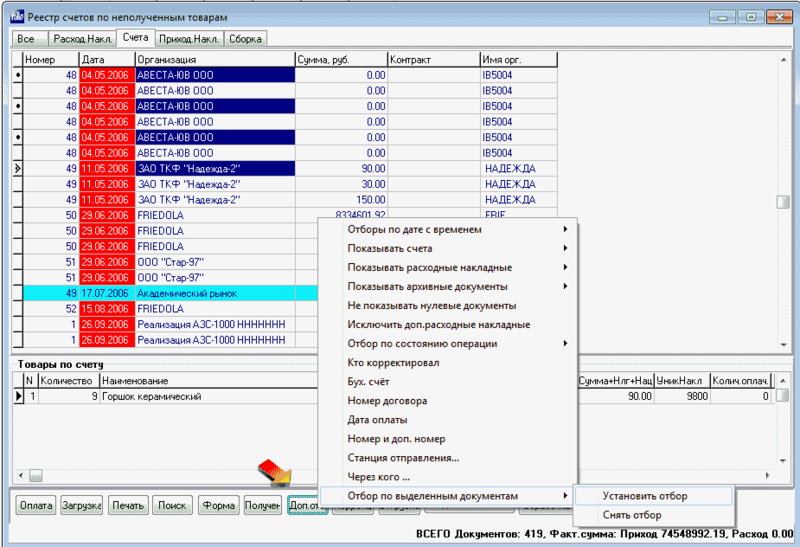 He brings to the scanner a taken path page, from which the bar code of the job under the path is read out, and then he brings own бейджик with the bar code identifying the loader. In the program there is a message, that the job is accepted to fulfilment by the employee by such, and the information on the beginning of execution of the job is automatically routed to the logistics program. The loader fulfils the job of a path page and again approaches to the scanner coupled to the special program. He again applies a bar code of the jobs put on a path page and бейджик with a bar code, informing the program about completion of the job. In the program FOLIO Logistc-Warehouse automatically there is a fixing of operations, which correspond to a path page, there are necessary documents and the status of a warehouse is adjusted. Thus, now it is possible to start up the system of storage in the rather large warehouse, having received complete automation of routine procedures of the registration of intermediate documents. It, first, will result in absence of additional errors and delays at output of the jobs(definitions) on movement(traffic) in a warehouse and filing of the information about their execution. Besides the necessity passes to put absent bar codes on the goods and to purchase not so cheap terminals of data gathering. Certainly, in comparison with the classical system of automation realized in FOLIO WMS, the accuracy of this implementation is lower, but the complexity of implantation and common costs is much less. Therefore, each corporation needs to select, that in the given moment for it it is more important and to realizesuch more simple solution or complete scale management system of a warehouse (FOLIO WMS). On one of warehouses of the «rus.bolt» company, offering a huge range of qualitative fixture for automobiles and civil work, the solution «FOLIO WMS» is inserted. It is interesting, that the solution took root by own forces of the company by transfer of the information from the own registration system into the program «FOLIO WMS». Thus, the definition was formed for the managers responding for delivery and sale in the system, and then was transmitted on a warehouse, where was automatically formed for the loaders working with wireless terminals (RT) of data gathering. The system «FOLIO WMS» specified with what batch bin and what goods are necessary be for removing or for delivering according to an optimal method of allocation. The new method of automatic allocation of the goods was written under orders of the Customer. The new type of limitation of cells is entered new algorithms of fixing of selection it is ground given from a wireless terminal. The assignment of number of packing is fulfilled at assembly of the orders for RT, new method of search by a fragment of the code number in the quick reference of the goods in RT. 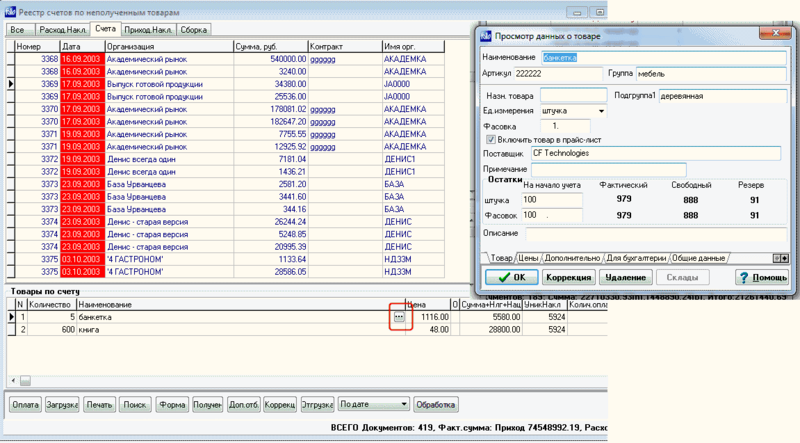 The transmission of the jobs(definitions) from the registration system in «FOLIO WMS» is carried out by loading superimposed of the Excel - file formed main registration system. After successful implantation duplicating the made solution in other warehouses of the company is supposed. In the quick reference of organizations of the program «FOLIO WinStore» the possibility to fill in the properties of bank automatically is added. It is made by introduction only it BIC - bank identification code. The BIC qualifier carries on a Russian Federation Central Bank. To receive a current status of the quick reference it is possible automatically pushing the appropriate item in the main menu. Thus there is a call in the Internet and synchronization of the BIC quick reference in the program to the quick reference of Central Bank.